Everyone needs to read Nicholas Rossis’ reviews of these two books. Mr. Rossis’ commentary is as thought-provoking as the volumes themselves. Thank you, Nicholas Rossis. Yes, I borrowed the title from the well-known Month Python sketch from Life of Brian. 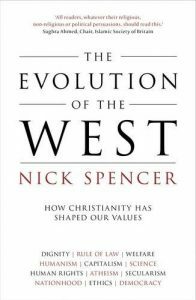 Knowing my interest in religions and history, Electra got me The Evolution Of The West by Nick Spencer, based on a recent review by The Economist (from which I’m quoting below). A book that is doubly appropriate, as it examines the effect of Christianity on Western values, and argues that, to understand our present and shape our future, we really need to examine the past. And Christianity is a formative part of that past – surprisingly so for our secular times, when authors from Diderot to Richard Dawkins have raved about the triumph of secular man. What, after all, has Christianity ever done for us?